THE DISGRACEFUL LORD GRAY is the third book in THE KING’S ELITE series and it didn’t disappoint. Reuniting with those in the King’s Elite and the Invisibles as they continue to look for the head of the smuggling ring they’ve been chasing in the previous books brought me back as if I’d never left. While less-action packed than some of Ms. Heath’s previous books, there is still enough spying, fighting, and romance to keep my interest from the first page to the last. The book is set in the early 1800’s in England. Thea and Lord Gray meet up unexpectedly. He’s naked in a brook on her property when she’s out with her friend, Harriet, who has taken up painting. They get acquainted with him as he’s Thea’s new neighbor. His dog is quite taken with Thea as well. Gray’s a spy, although she’s not aware of that, and she’s an heiress, but he has no notion of her wealth. They do have an immediate attraction and things take off from there. We get to meet Thea’s family and Gray’s cousin, and it was interesting getting to know everyone. There are a lot of secrets (not only in regards to the smuggling.) Things aren’t always what they seem. There are twists and turns to the story and wonderful descriptions of Thea’s home, the grounds, and the characters. The characters have a depth to them—what you see is definitely not what you get! There was nice closure and a few happily ever afters along with solving the mystery of the smuggling ring. I look forward to reading the last book in this series. 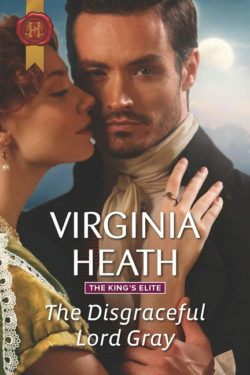 Ms. Heath is one of my favorite authors of historical romances set in England. I always look forward to reading her next books.